Suzy Klein presents a selection of music and guests from the arts world. Her guests include Stuart Skelton, John Harle and the Solem Quartet. Suzy Klein with a lively mixture of arts news, interviews and live performance. Tenor Stuart Skelton performs Wagner and Verdi and talks about the 2017 International Opera Awards and his new role as their artistic ambassador. Composer and saxophonist John Harle tells Suzy about his ballet score for Birmingham Royal Ballet (in which he also performs). 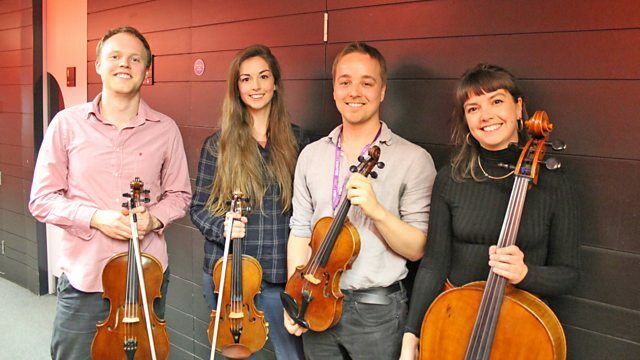 The Solem Quartet perform Haydn and Mendelssohn in advance of upcoming concerts in London. Orchestra: Staatskapelle Dresden. Conductor: Colin Davis. Performer: Stuart Skelton (tenor). Performer: Richard Peirson (piano). Singer: Renata Scotto. Orchestra: Philharmonia Orchestra. Conductor: Lorin Maazel. Opera Arias: Donizetti, Bellini, Verdi, Puccini, Mozart. Jean-Marie Leclair: Violin Concertos Op. 7 - Nos. 1, 3, 4 & 5. Performer: John Harle. Performer: Academy of St Martin in the Fields. Conductor: Neville Marriner. Performer: John Harle. Performer: Pavel Šporcl. Performer: Steve Lodder. Singer: Dmitri Hvorostovsky. Orchestra: Orchestre de Paris. Conductor: Semyon Bychkov. Sammartini: 6 Concertos in 7 Parts, Op. 2. Orchestra: Wexford Festival Opera Orchestra. Conductor: Francesco Cilluffo. Performer: Marco Beasley. Ensemble: Private Musicke. Singer: Dame Sarah Connolly. Conductor: Harry Christophers. Orchestra: Symphony of Harmony and Invention. Heroes and Heroines: Handel Arias.